(2015/12/21) Due to limited resources and the situation that students involving in this project have graduated, we decide to stop the efforts of malware dataset sharing. To mitigate malware threats on mobile platforms (e.g., Android) and engage the research community to better our understanding and defense, we are happy to release our dataset to the community. However, to avoid this dataset from being misused, we feel the need to have some sort of authentication in place to verify user identity or require necessary justification, instead of making the dataset completely public. For that purpose, if you are interested in getting access to our dataset, please read the following instructions carefully -- before sending us emails. (a) If you are a student (or postdoc), please ask your advisor (or host) to send us an email for the access. If you are a faculty, please send us the email from your university's email account. (b) In your email, please include your name, affiliation, and homepage (if we do not know each other). The information is needed for verification purpose. Note that your request may be ignored if we are not able to determine your identity or affiliation. Again, please send us the request from your university's email account. (c) If your papers or articles use our dataset, please cite our Oakland 2012 paper as follows. (a) Please send us an email from your company's email account. In the email, please briefly introduce yourself (e.g., name and title -- in case we do not know each other) and your company. (b) In the email, please attach a justification letter (in PDF format) in official letterhead. 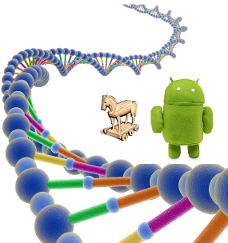 The justification letter needs to acknowledge the "Android Malware Genome" project from NC State University and state clearly the reasons why the dataset is being requested. Also, acknowledge that the dataset will not be shared to others without our permission. We emphasize that we will ignore emails that do not follow the above instructions. Note that we may disclose the list of universities, research labs, companies that have requested our dataset on this webpage. Again, you are not allowed to share any samples in our dataset to others without our permission. Sending us the email for our dataset access implies that you are aware of and agree with the above policies. Please send your request emails to Yajin Zhou () AND Dr. Xuxian Jiang () with "[MalGenome Samples Request]" in the subject. Until now, we have released this dataset to the following universities, research labs and companies.